The Peleador replica family is the budget range of the CXP series. 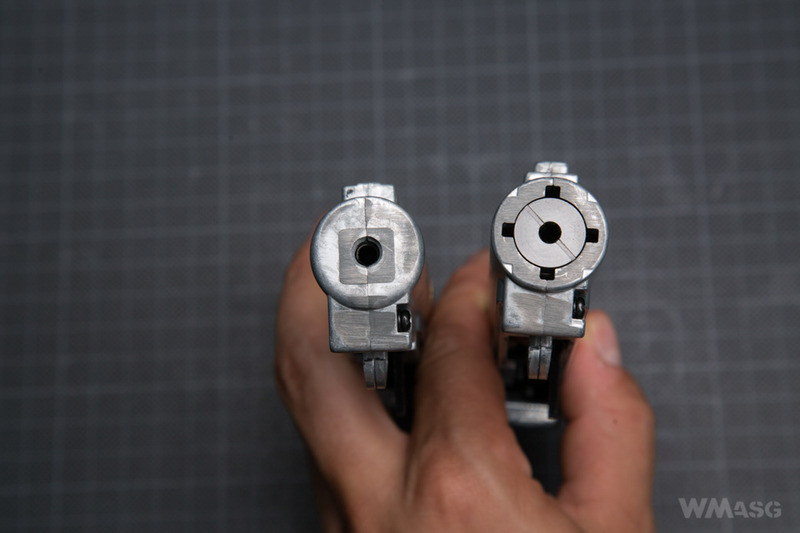 There are 2 versions available, differing in barrel length: 375 mm and 303 mm, each manufactured in black or tan color. In total, technically, these are 4 identical replicas with comparable performance. 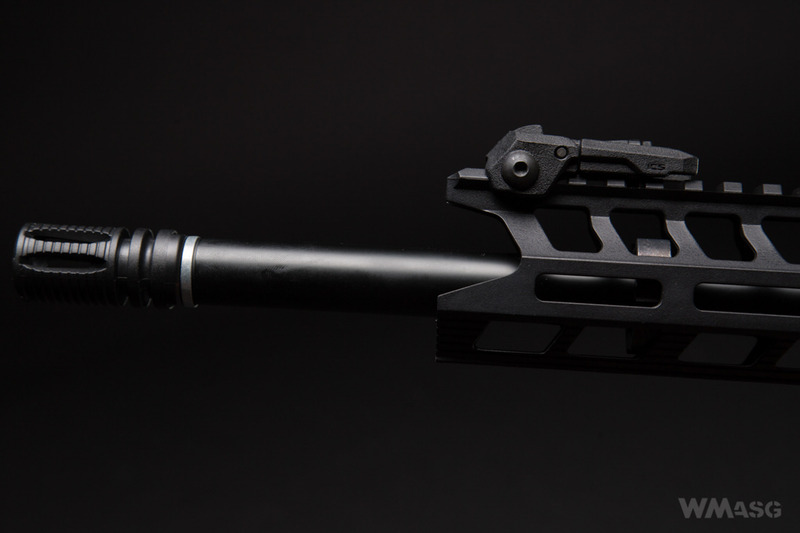 - a low-profile, quick-release and folding CFS sights. 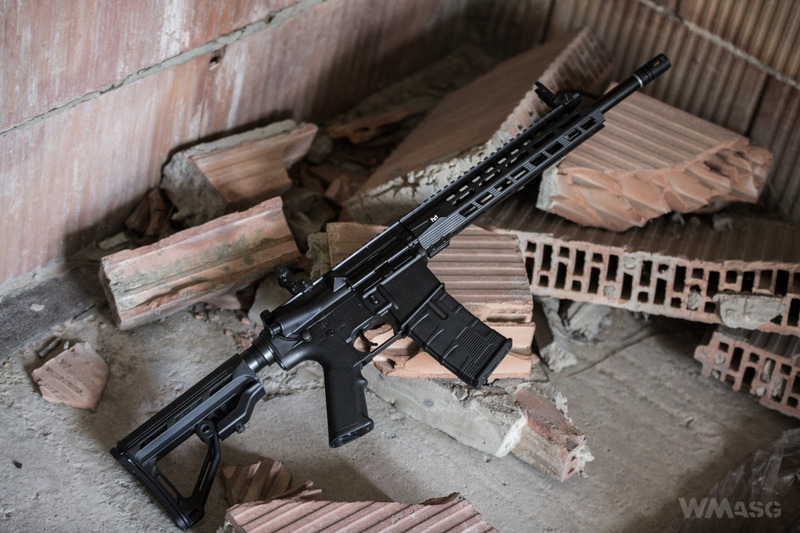 For testing, we received a black carbine with a barrel length of 375 mm (manufacturer code: ICS-440). 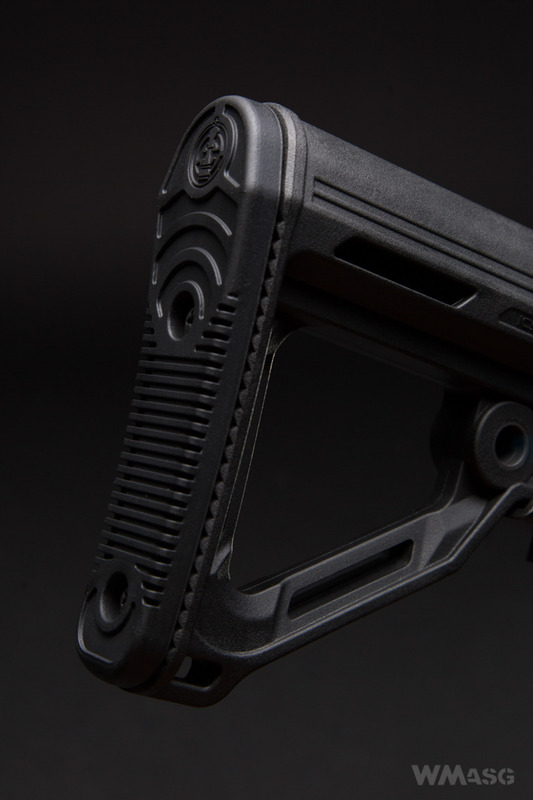 The carbine came packed in a two-color, rigid box duly protecting the replica against damage. 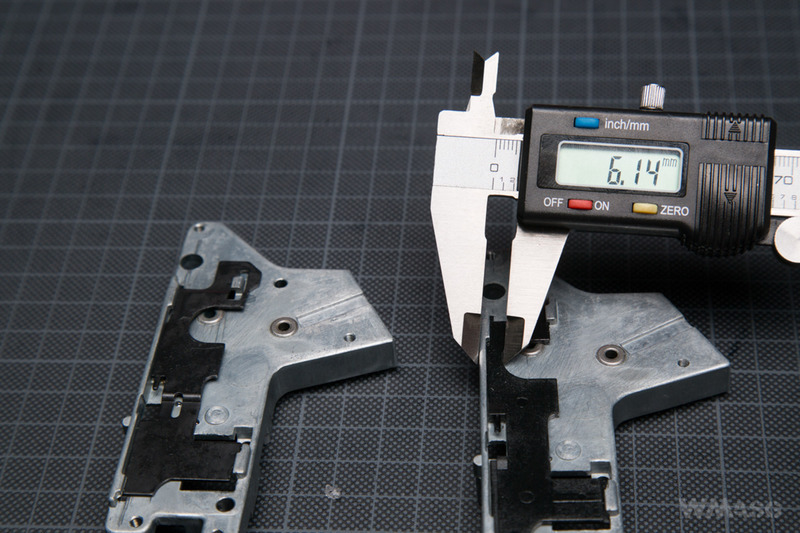 The interior is made of thin molded plastic, formed into slots and compartments for individual parts of the set. In addition, the top part is covered with a foam sheet. - a folded colour leaflet with the list of ICS replicas. The plastic body of the carbine looks surprisingly well. It is hard to say that it is not made of metal without taking a replica into one's hands. 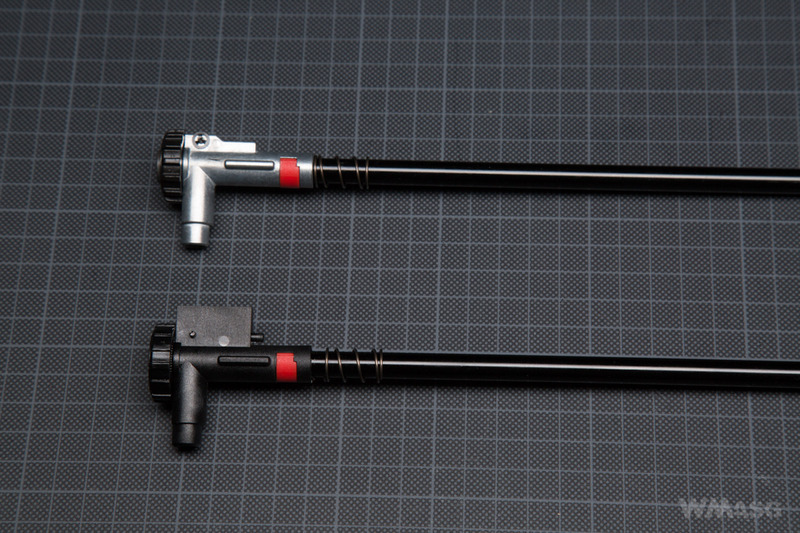 The uniformly black front and the black, slightly shiny external barrel look somewhat worse. After taking a carbine and trying to shoot it, the situation looks a bit worse. 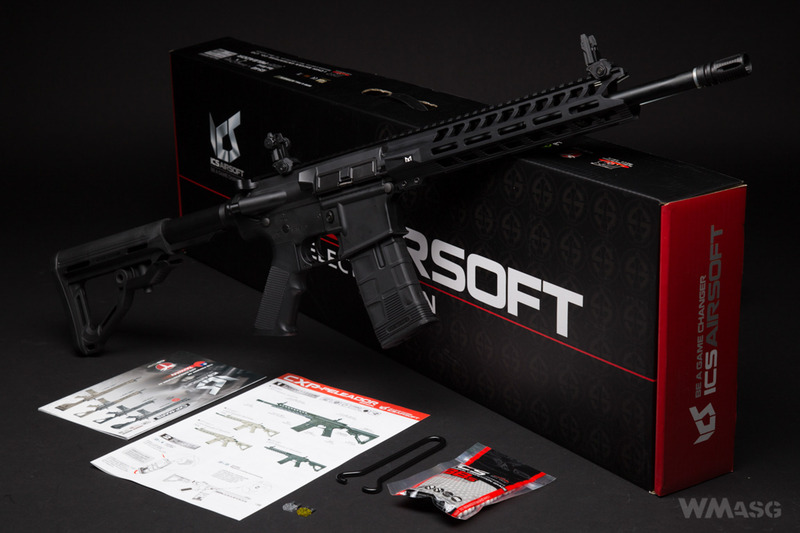 Despite the ergonomics characteristic to replicas of all AR-15 rifles, it is easy to feel that we are dealing with a budget version. Above all, the dubious stiffness of this replica raises our doubts. 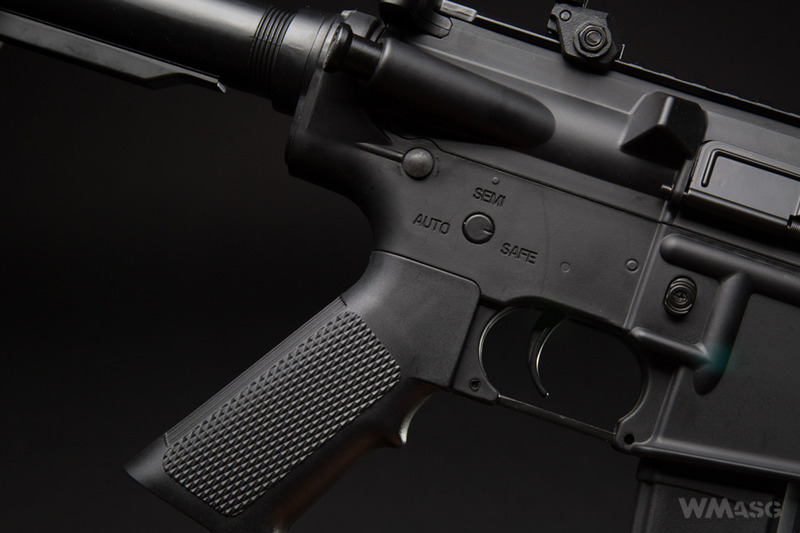 However, it should be noted that this is not an individual problem of the tested replica, but a common feature of all AR-15 rifles replicas with plastic receivers. 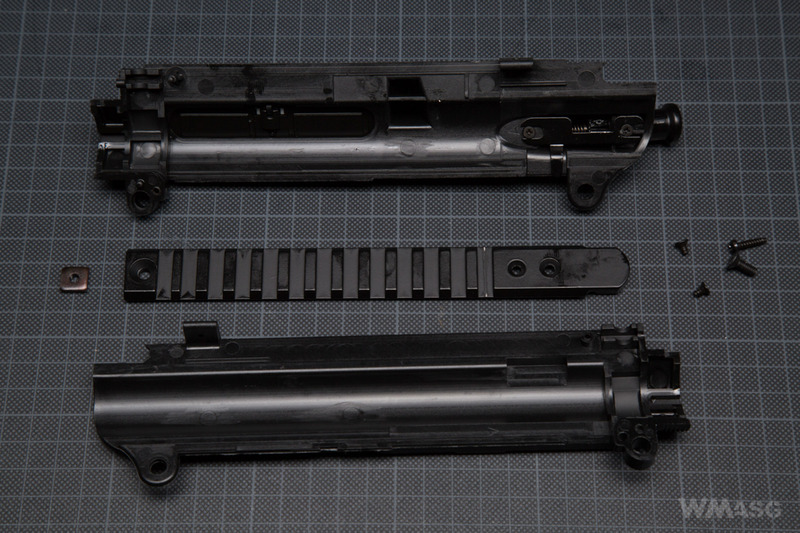 It was the same with the replicas Tokyo Marui which used to be the determinant of the highest quality replicas for many years. 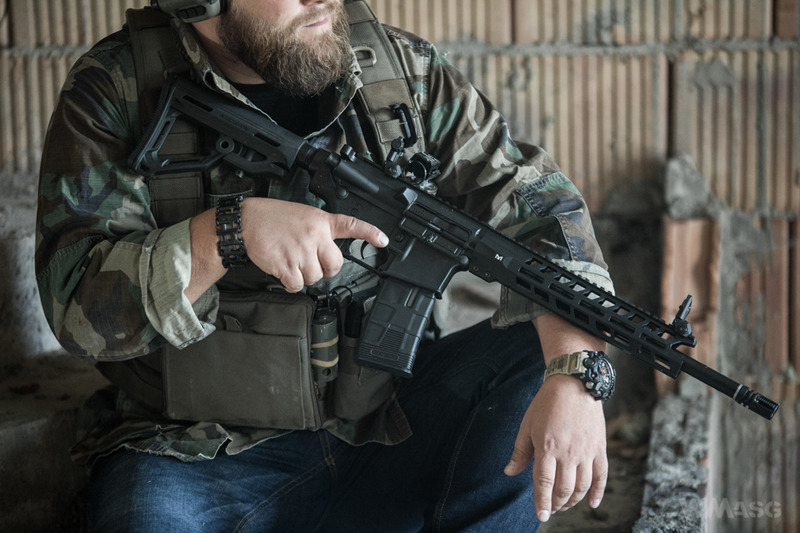 The receiver, the pistol grip and the one-sided manipulators are made according to the "old school" design, that is according to the specification of the M4 carbines from the mid 1990s. Pressing the forward assist moves the anti-reversal latch and releases the main spring. Use this feature when storing the replica between the games. 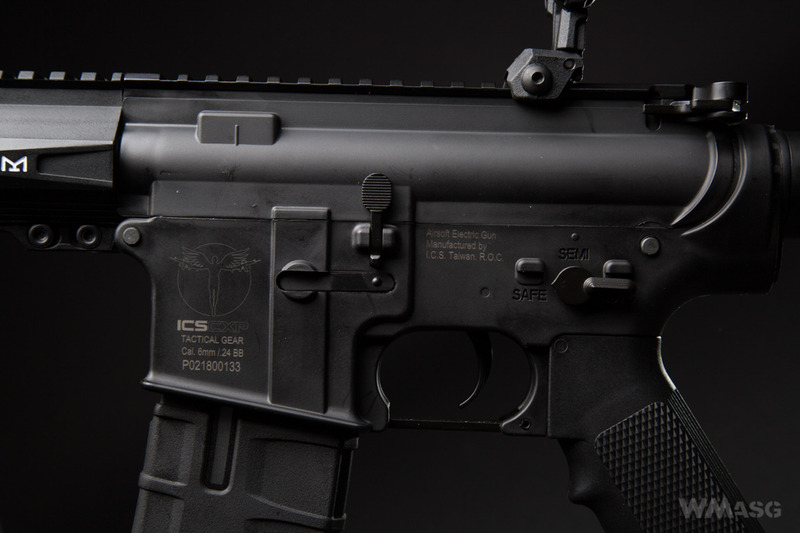 A characteristic feature of ICS plastic receivers is a two-piece rear plate. 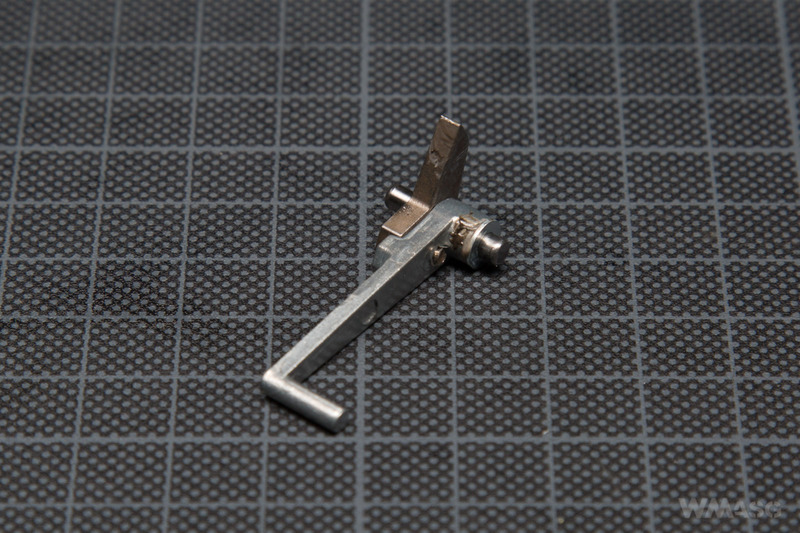 Therefore, attaching an accessory belt mounting ring often requires the use of a file or a micro-ginder. 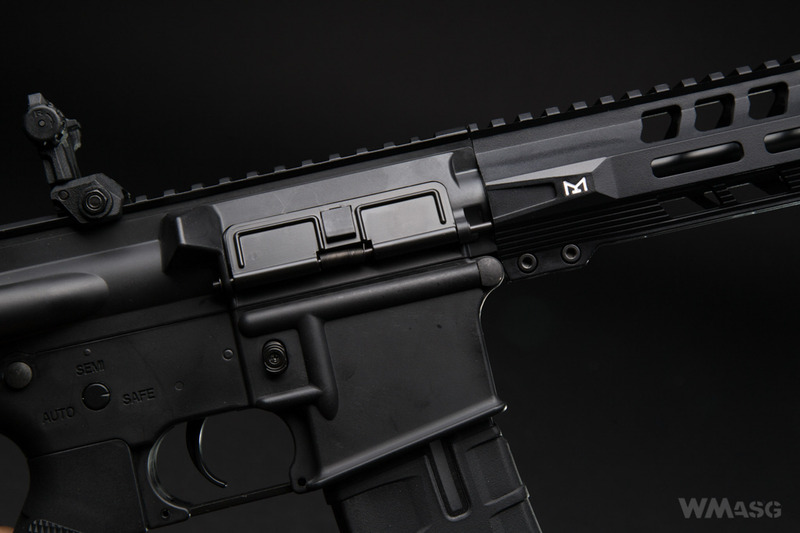 The 10-inch front in the M-LOK standard is marked with a characteristic stylized letter M. Despite being made of plastic, it is licensed by Magpul, just like all the products implementing the assembly system designed by this manufacturer. At the bottom and sides there are 5 sockets for mounting accessories. 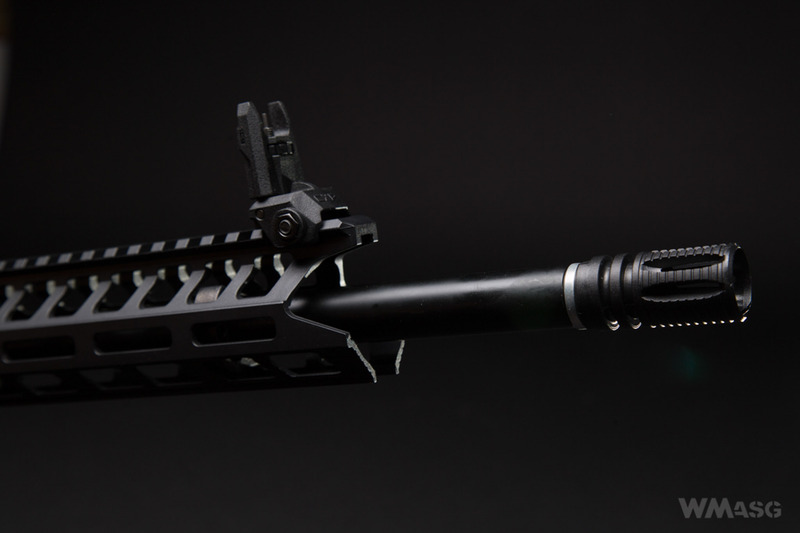 On the top, a Picatinny rail is installed and it is adjusted to the height of the rail on the top of the upper receiver. They are made of plastic. They can be folded and are mounted on the top Picatinny rail. They are lifted by hand. In the working position they are very stable. 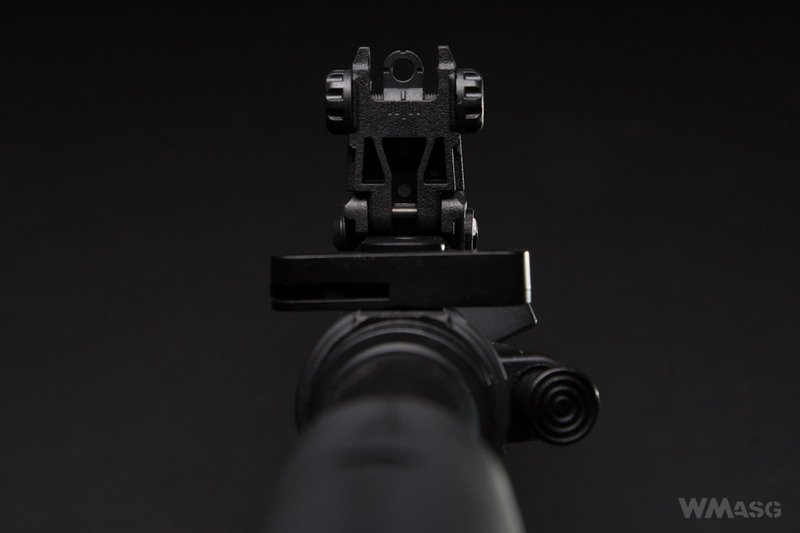 They are adjusted with knobs without the need to use any tools: the front sight vertically, the rear sight horizontally. 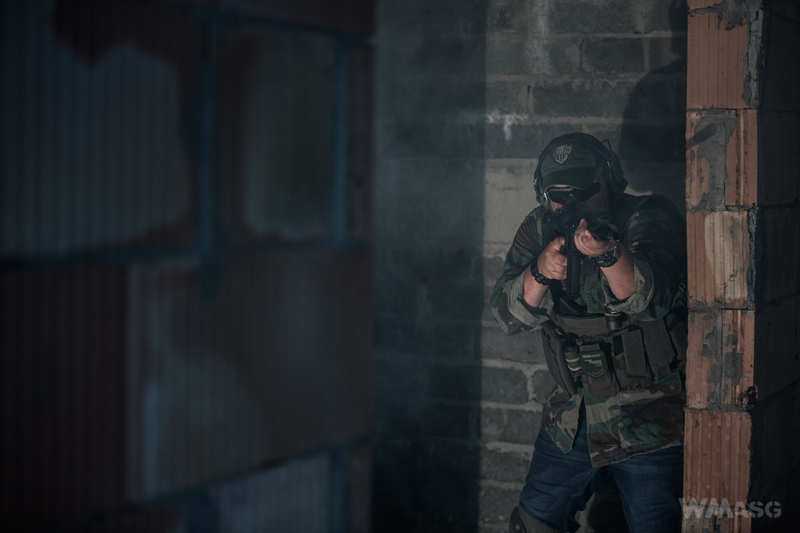 It is possible, although not easy, to use the sight without lifting them as low profile sights. 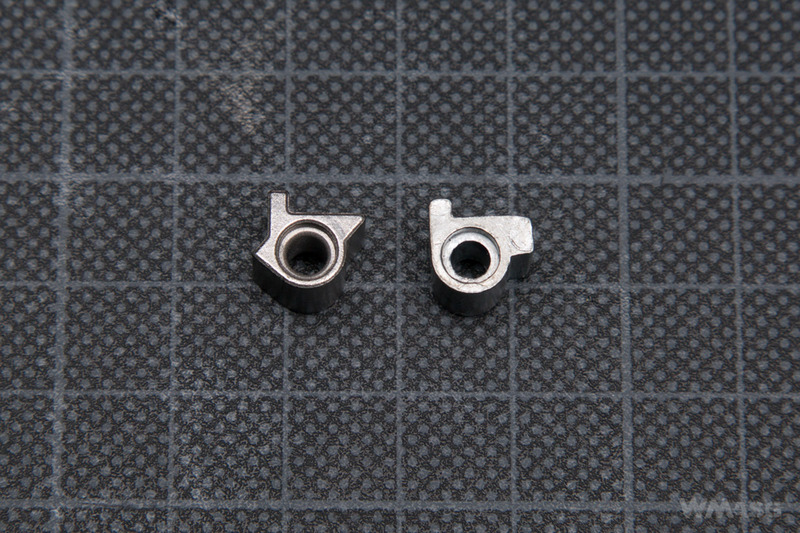 Then only the rear sight is adjustable (horizontally). The metal barrel is made of 2 parts, but the connection is stiff and there are no clearances. 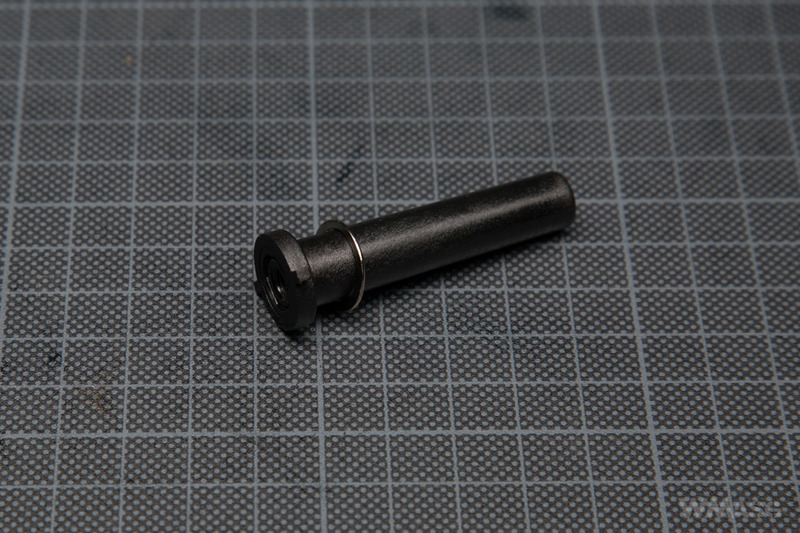 The barrel is finished with a counterclockwise 14 mm thread. 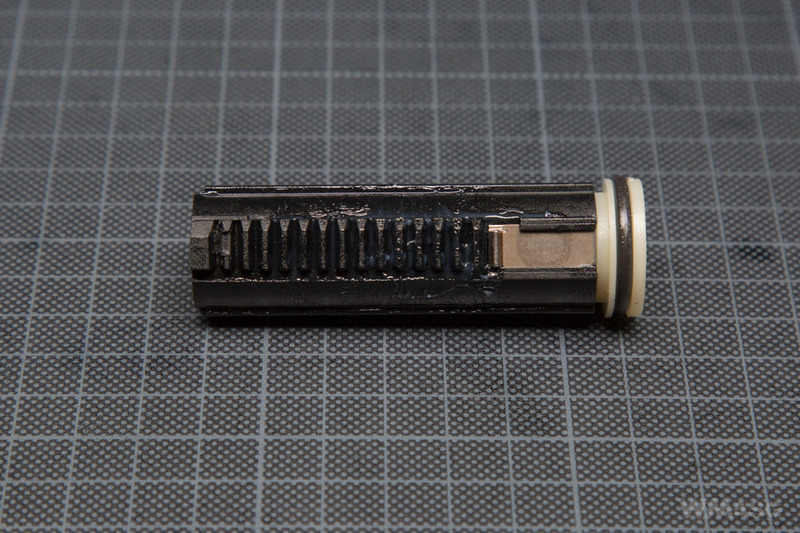 The flash hider is a slit type. There is no dummy blocks or gas tube. 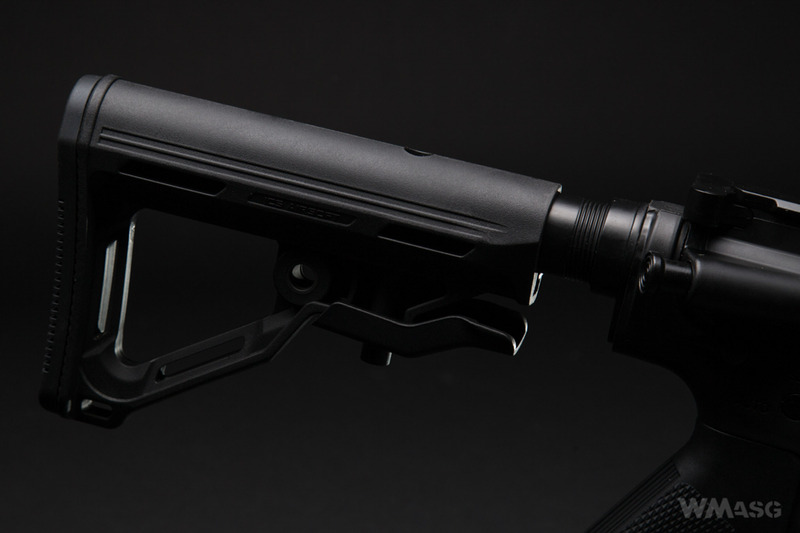 The buttstock is made of nylon reinforced polymer. 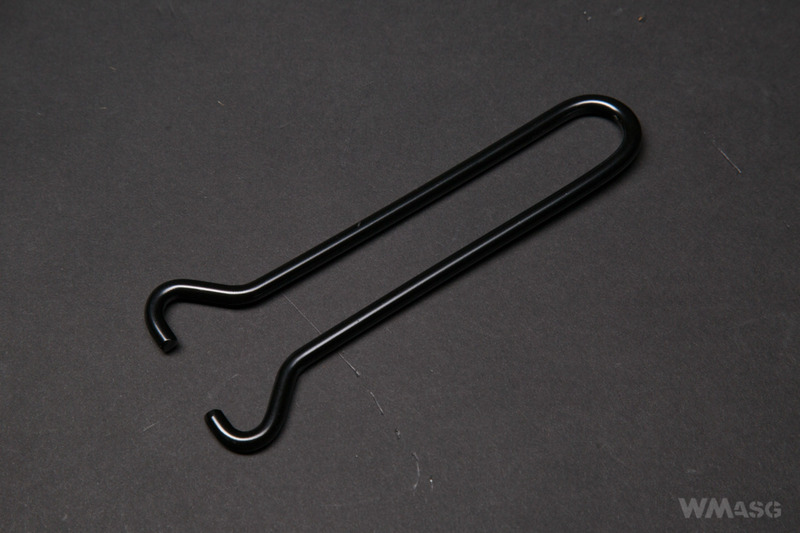 It has several options for attaching the carrying sling, including one QD mounting point on each side. The buttstock is distinguished by an inverted lever used to change the position on the guide. The guide itself was made of two parts. Thanks to this, the cables are run in special channels and are not exposed to any damage. An additional benefit is more space for the battery inside the guide. 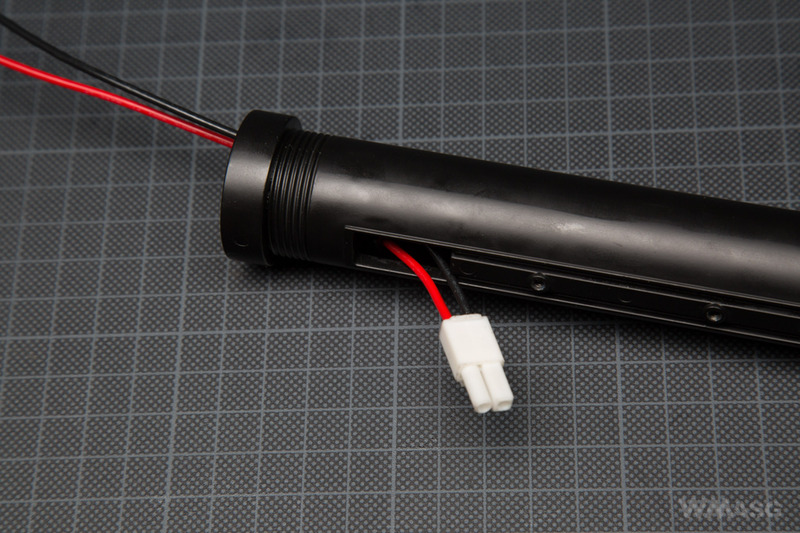 A LiPo 11.1 V 1400 mAh battery with dimensions of 21 x 20 x 130 mm can be easily installed there. 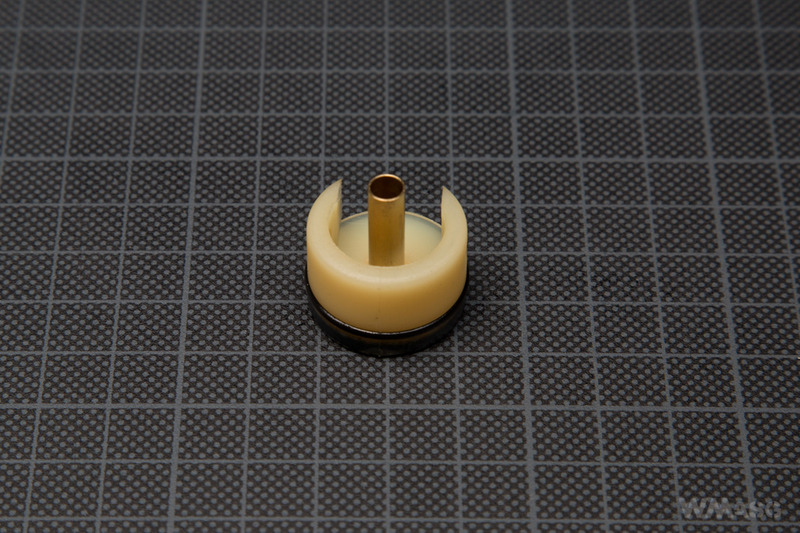 The magazine that comes with the replica is a hi-cap holding 300 BBs with a traditional winding wheel at the bottom. 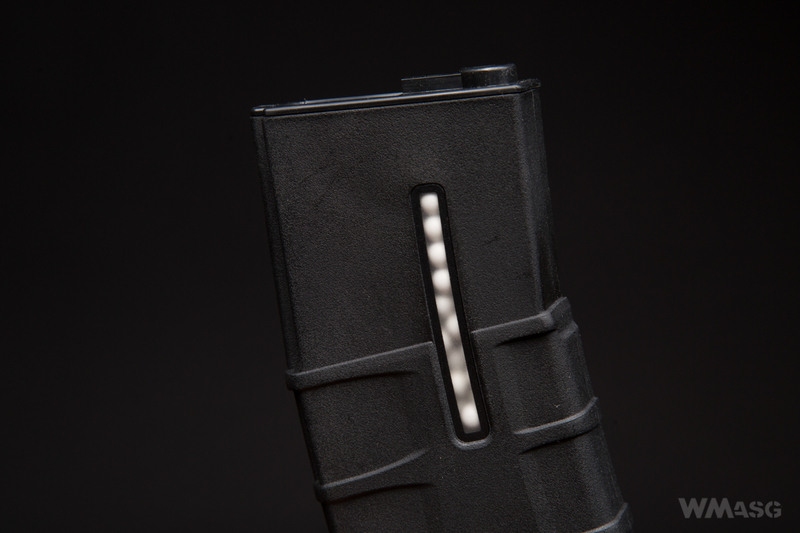 It is made of polymer and resembles the PMAG magazines. Through the windows in the side walls of the magazine, the amount of ammunition can be controlled, to a certain degree. In the manufacturer's catalog the magazine is called the T-Mag. 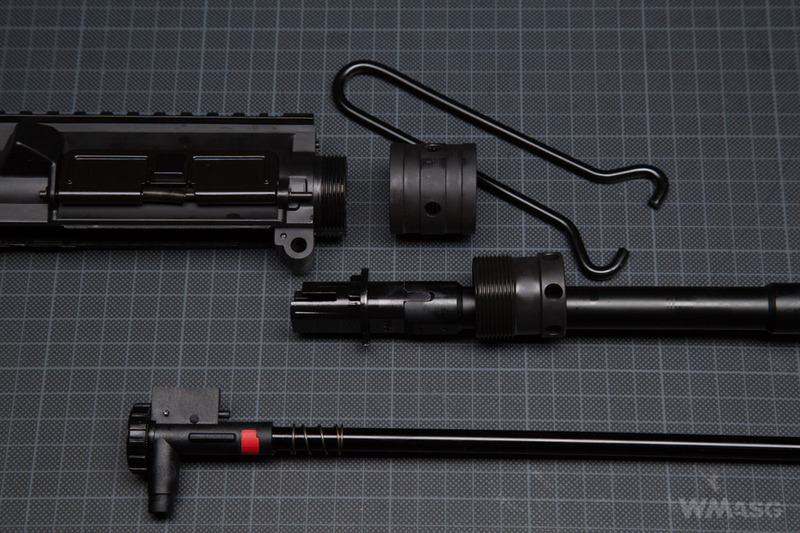 Before disassembling the carbine, it is advises to press the forward assist and release the spring. 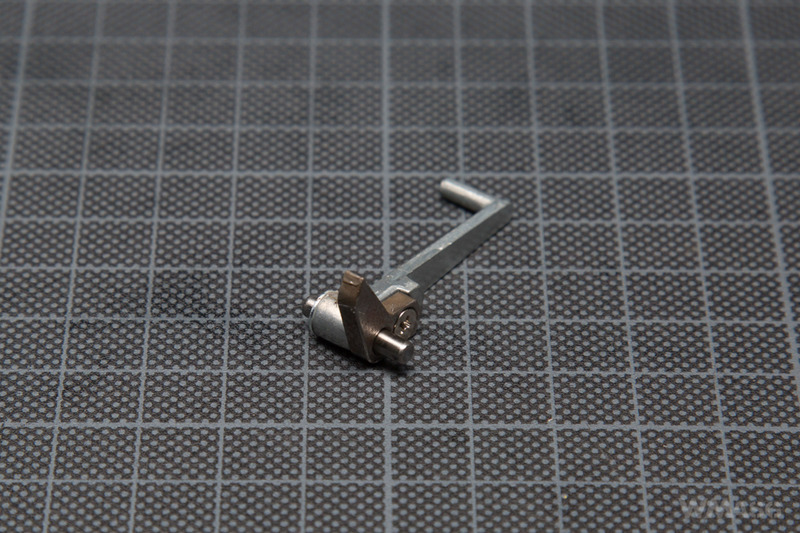 To unfold it, take out the rear pin and "break" the replica open. 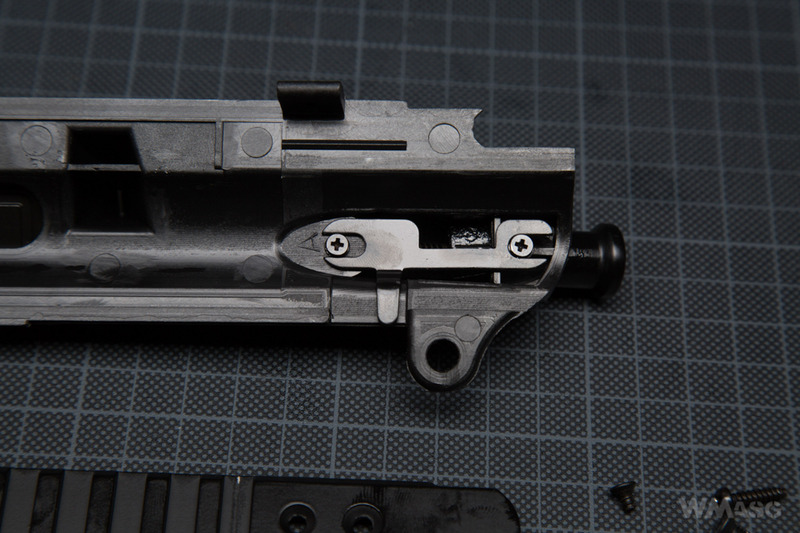 Then you can take out the front pin and disconnect the upper receiver from the lower receiver. The pins are not secured in any way therefore one has to be careful not to lose them. 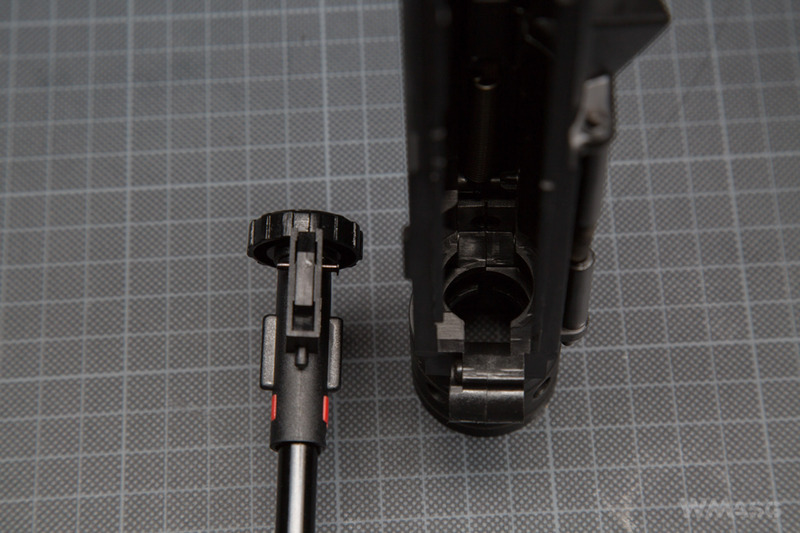 The upper part of the gearbox can be easily removed from the upper receiver. 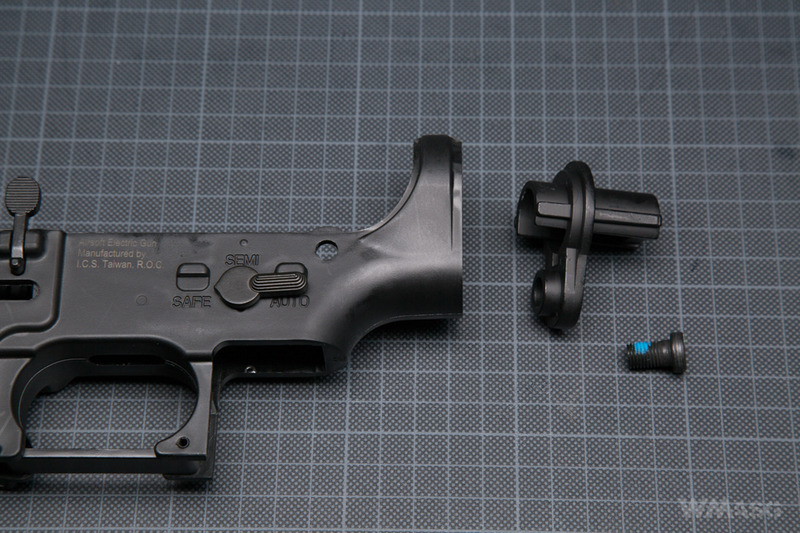 In order to pull the bottom part out one must unscrew the pistol grip, the magazine latch, and unscrew and take off the buttstock guide. 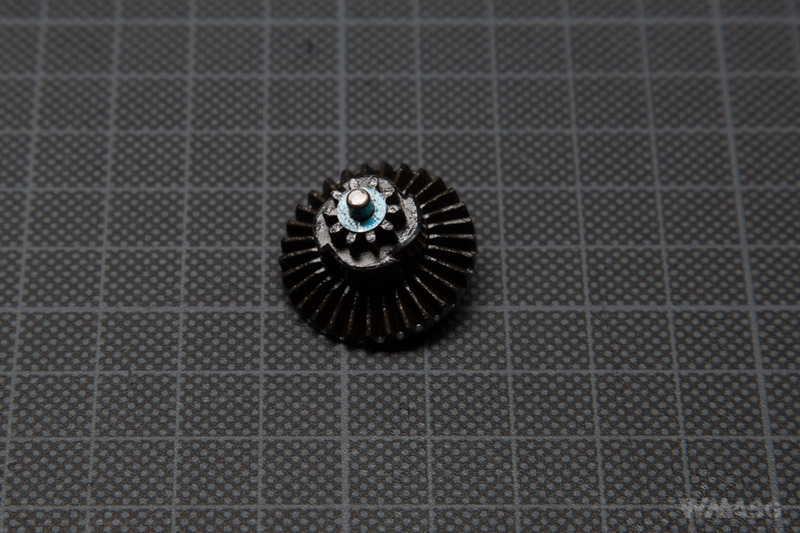 The assembly takes place in the reverse order, but attention must be paid when setting of the gears. The correct way to do it is described in the instructions manual. 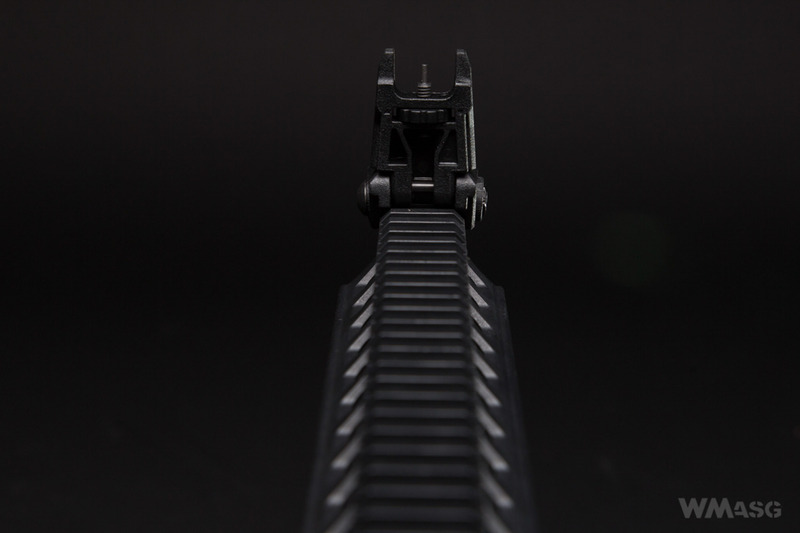 The ICS carbines do not have the thin pin located above the trigger, which is common feature of other AR-15 replicas (in the real rifle it is the trigger axis). 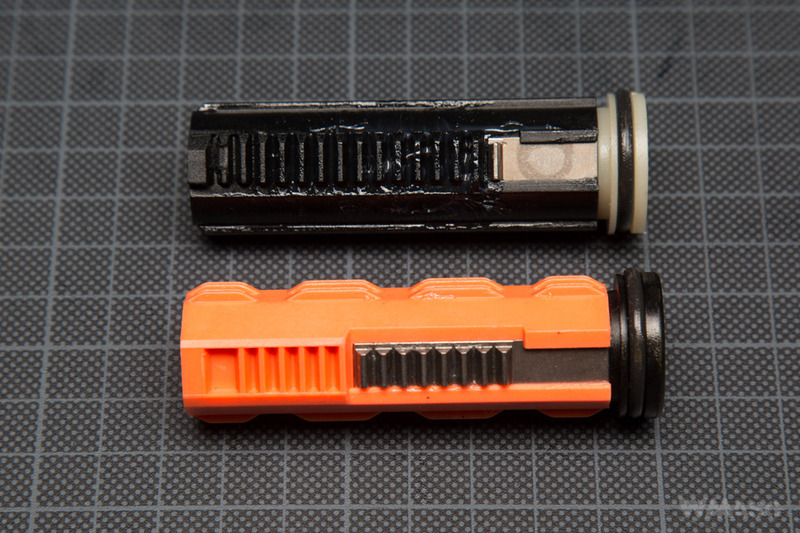 The inner barrel is 375 mm long, black, light and probably made of aluminum. It is very similar to the Mad Bull's Black Python barrel. 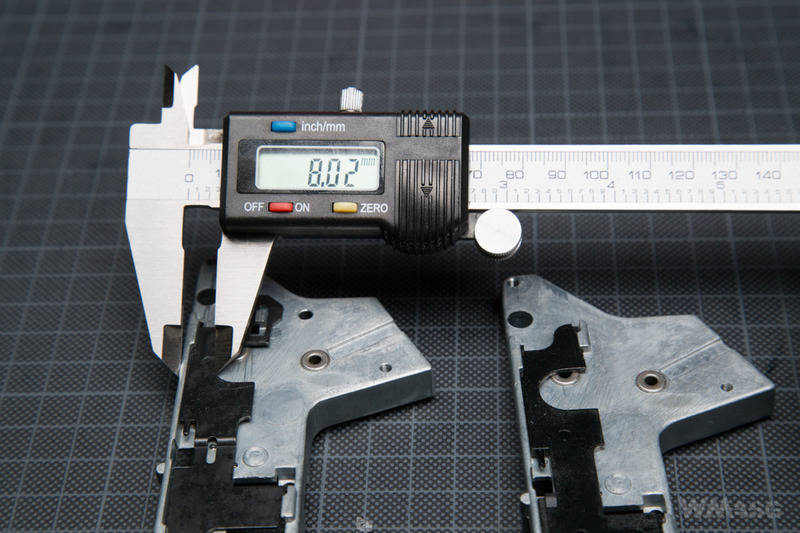 The manufacturer does not state its internal diameter in any way. 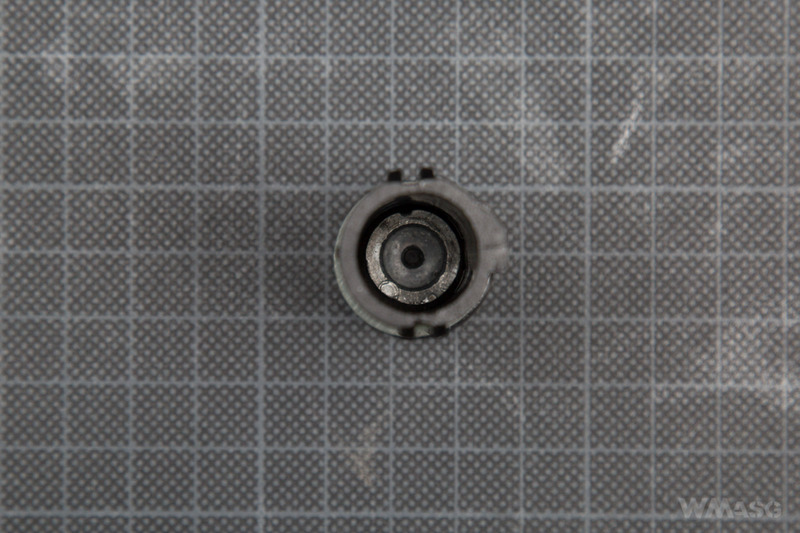 The Hop-Up chamber is a single-piece design made of metal, with one knob for adjustments mounted around the barrel's axis. By rotating it down we increase the Hop-Up, by rotating it down we reduce it. The bucking and the spacer are standard. 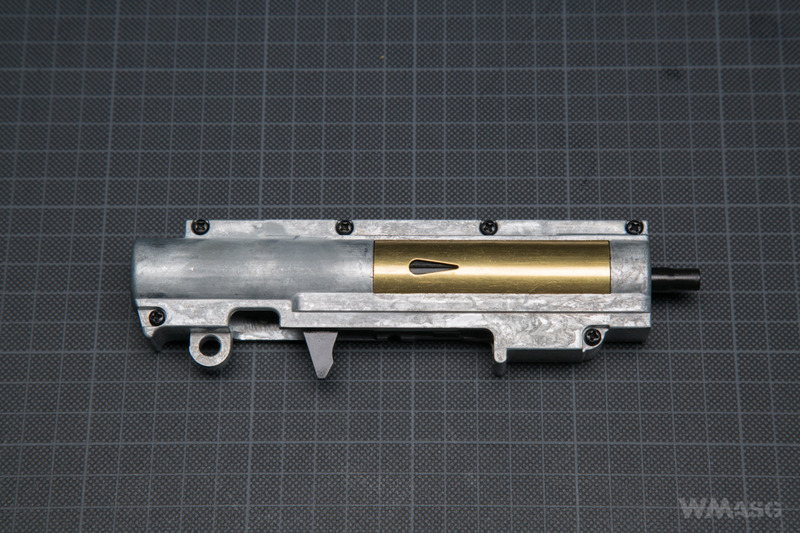 The chamber is pressed against the gearbox with a large spring slid over to the inner barrel. ATTENTION! 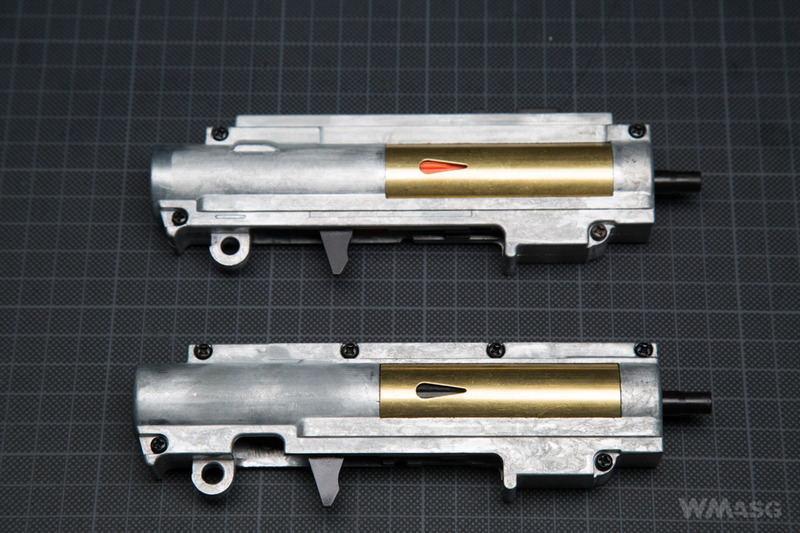 The chamber is not interchangeable with the ICS chamber dedicated for replicas with the electric blowback system (the top one). 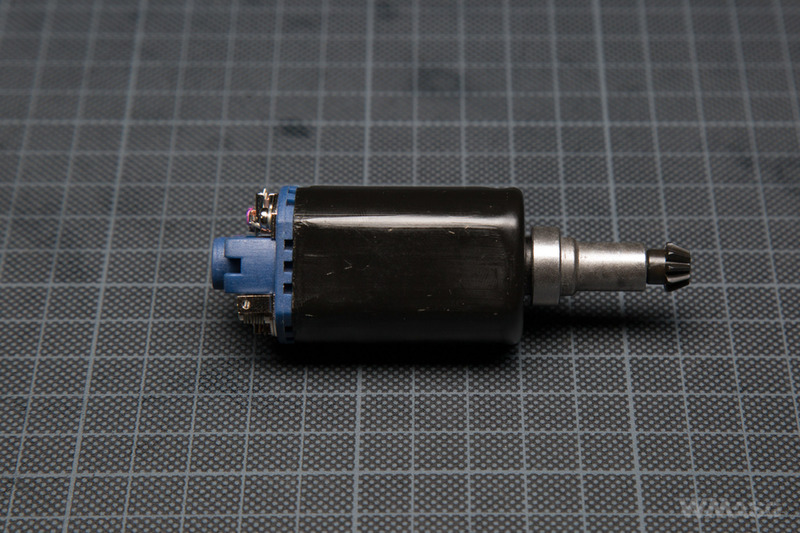 The two-part gearbox is does not have the EBB system nor the quick spring change system. The upper part contains the complete pneumatic system. 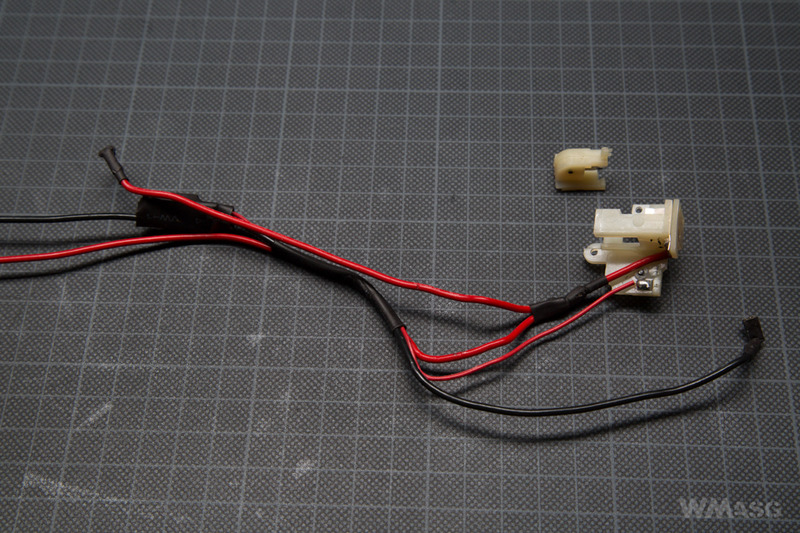 The Peleadors is a budget series and this is visible also in the type of the internal parts installed. The piston has one steel tooth, the piston head has no holes, it has no bearing and it is mounted inside the piston to a metal sleeve. 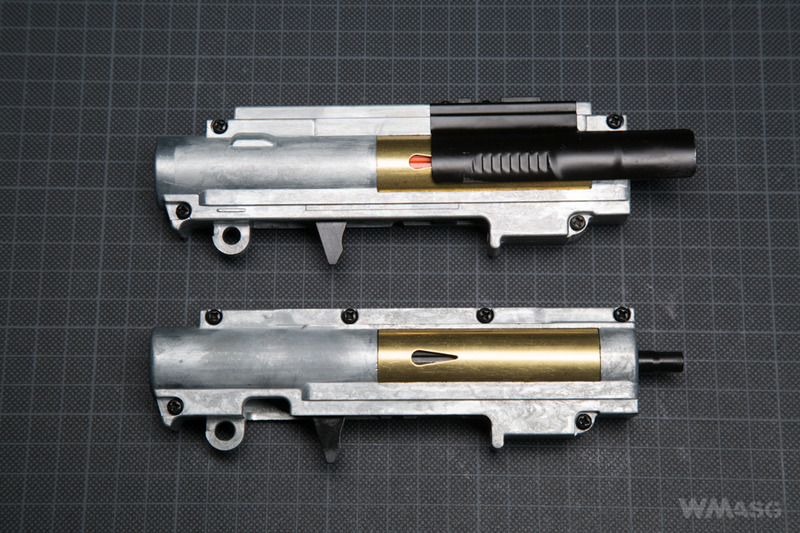 Below is a comparison of the Peleador's piston, with the piston used in the more expensive models of the CXP series. 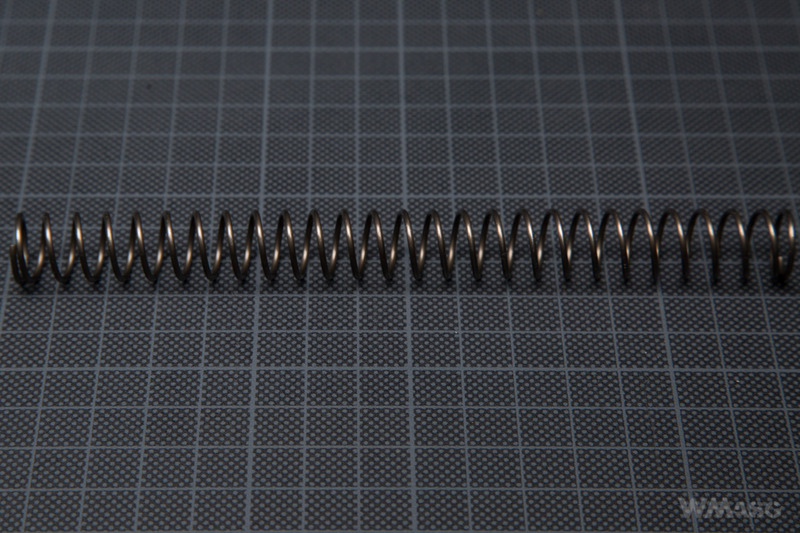 The spring has regular coils. 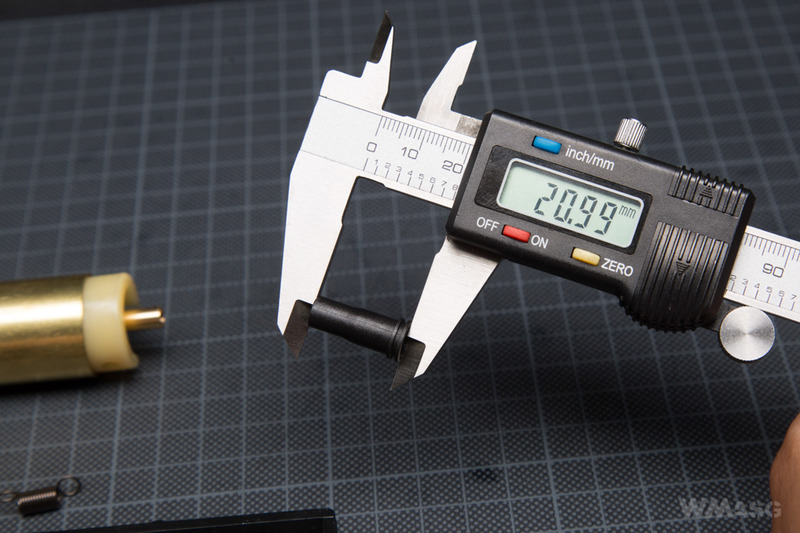 The nozzle is 20.99 mm long . It does not have an o-ring. The tappet plate is standard. The cylinder is made of brass. The cylinder head made of plastic and has a brass nozzle. 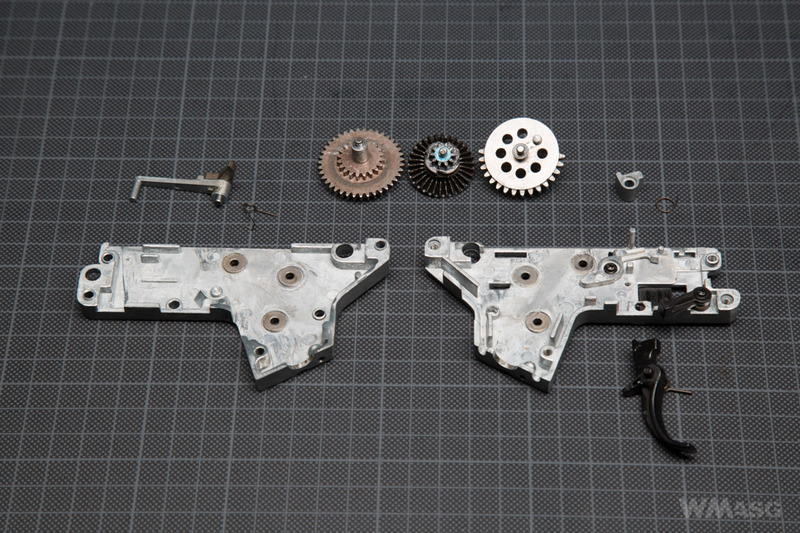 The upper part of the gearbox (bottom) is different from the one used in EBB replicas (top). 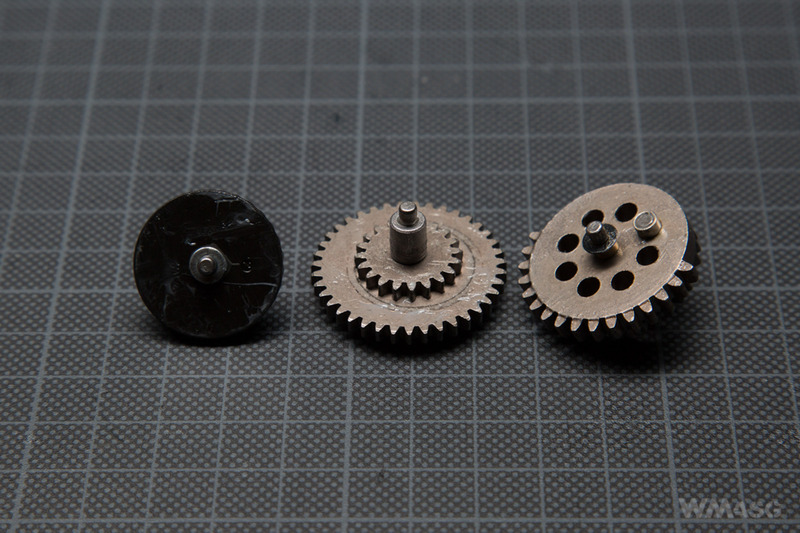 In the bottom part there are metal bushings and steel gears. The gears are also different than in the more expensive CXP models. 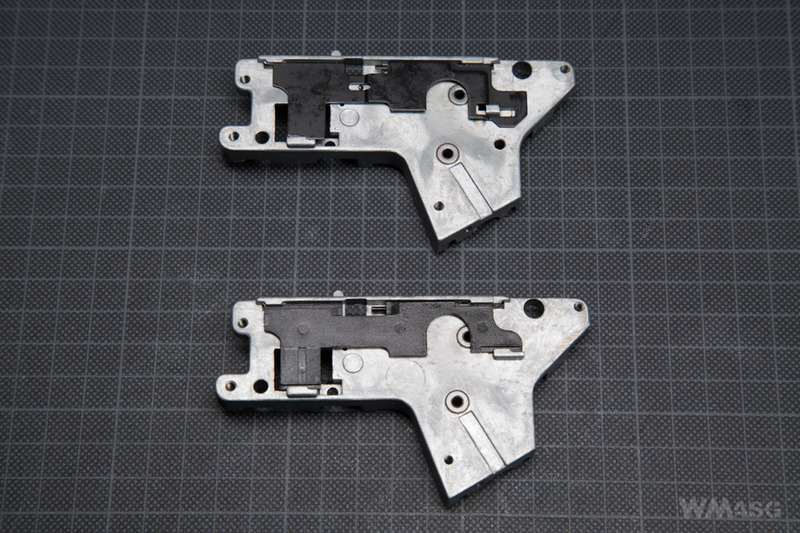 The anti-return latch has a special shape due to the spring release function. 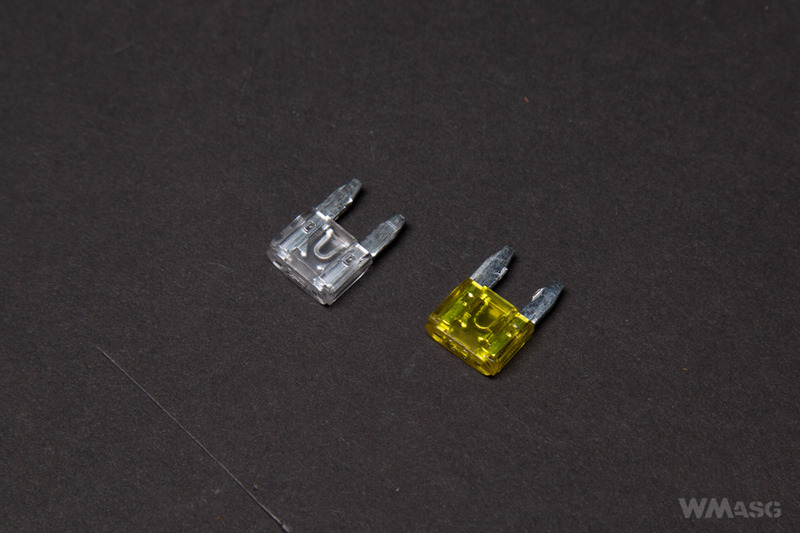 The trigger switch assembly is standard. The wires are rigid, encased in hard insulation. 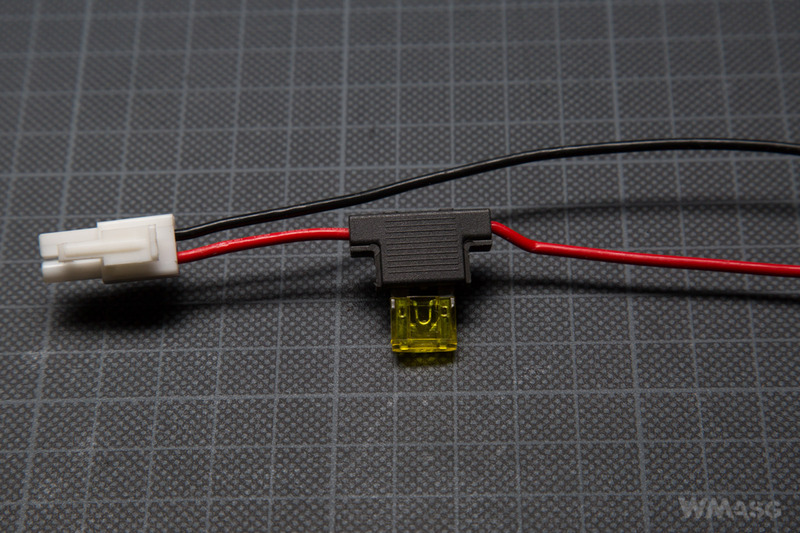 The wiring is equipped with a simple MOSFET. The installation method is simplified, without separate control wires. 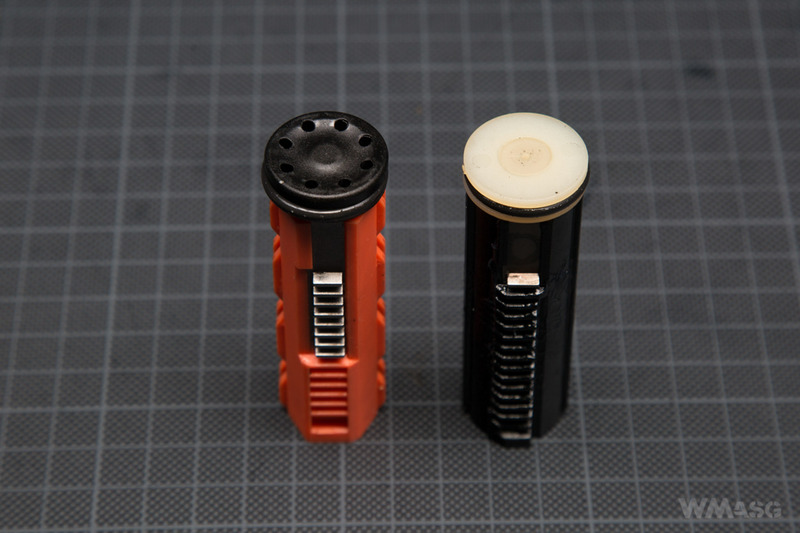 The battery plug is a mini Tamiya type. 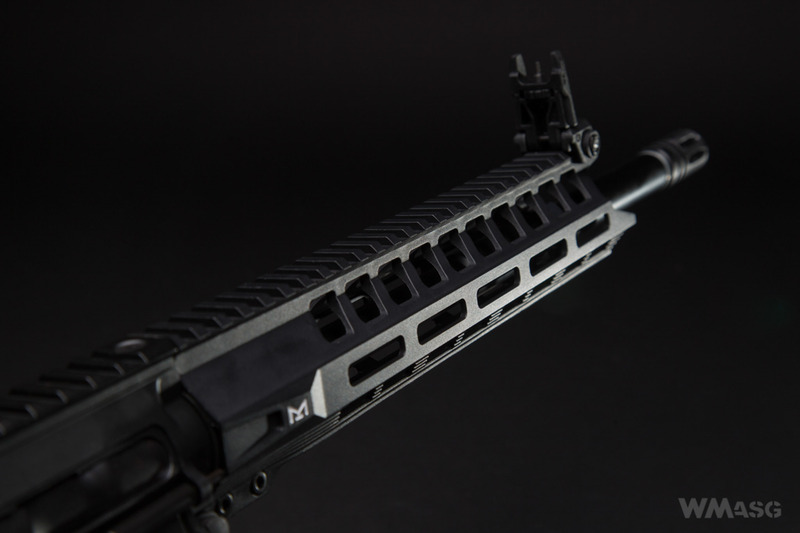 The safety selector plate is of the same standard as in most AR-15 replicas. It is different than in more expensive CXP models (Peleador is at the bottom). By the way, pay attention to the lower guide of plate at the back end, it also differs. The motor is standard, long and without markings. Its magnets are weak. The test was carried out on our own enclosed shooting range, at an ambient temperature of 24oC, the Hop-Up was set to zero. 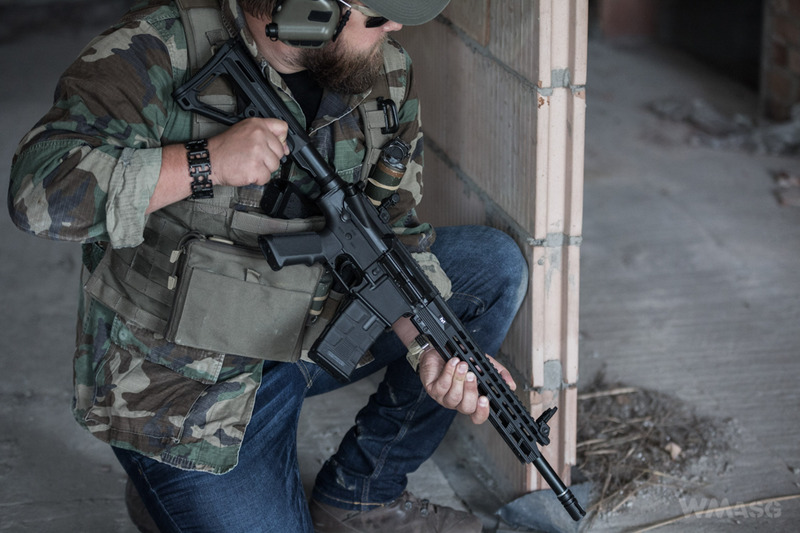 The muzzle velocity measurements were made with the XCORTECH X3500 chronograph using 0.2 g BBs. 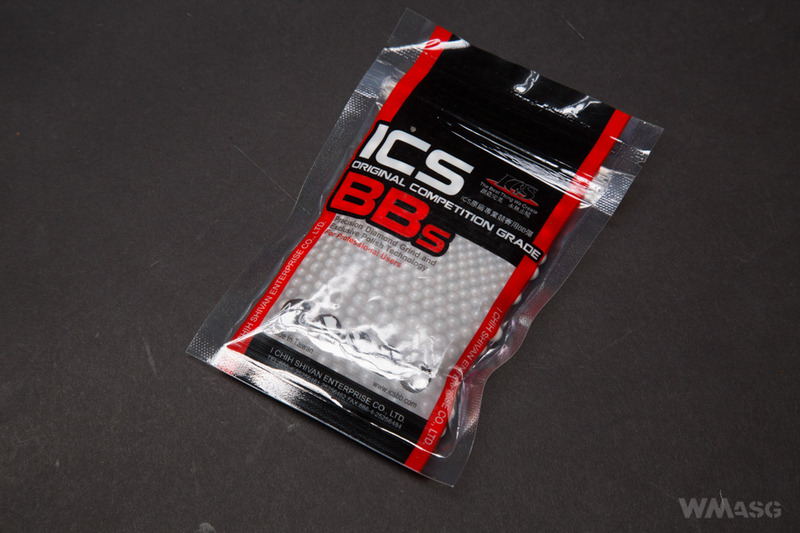 The target shooting test was done using 0.25 g BBs. 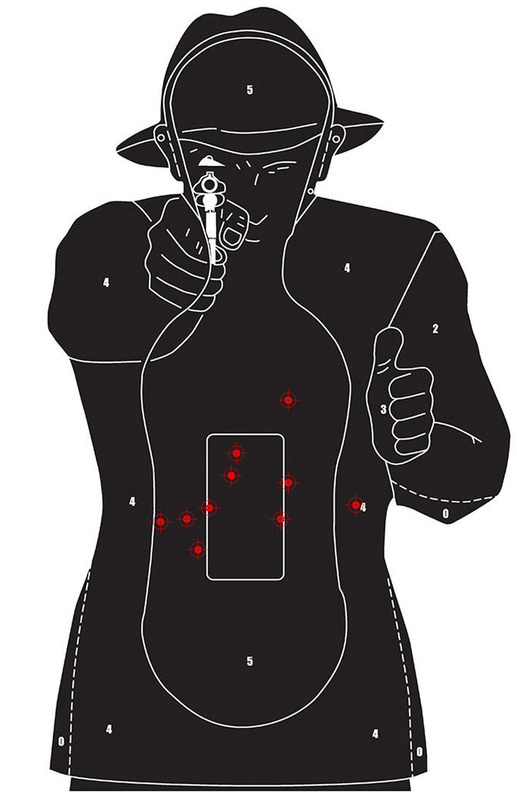 Distance from the target was 25 m. The shooting was made using the K-Zone shooting rest. 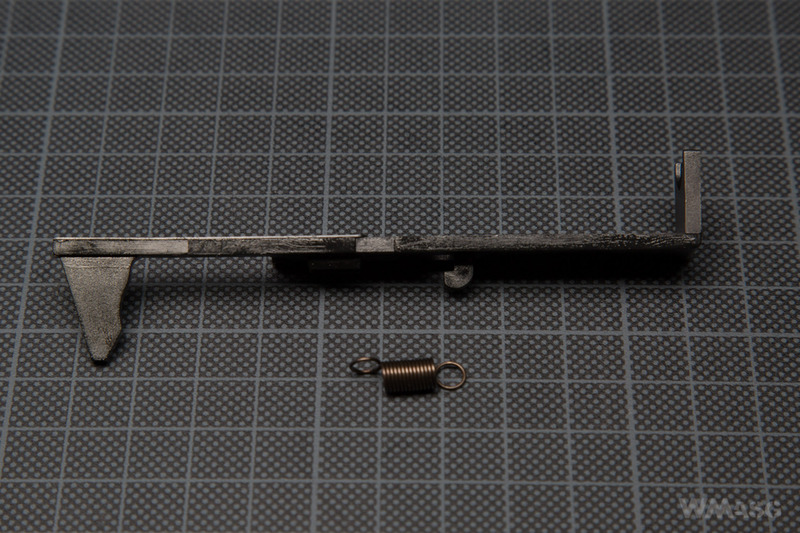 The results indicate that we have got a replica equipped with an M95 spring (different versions are available on different markets). 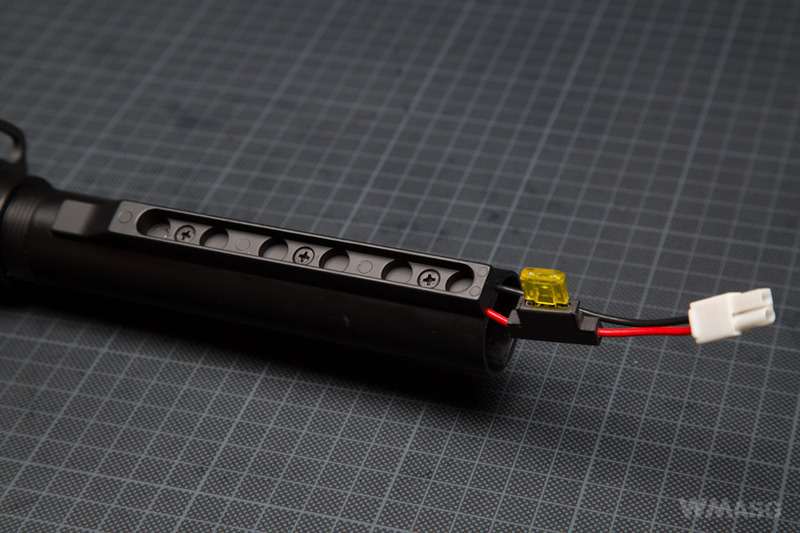 The measured rate of fire (using a LiPo 11.1 V 2400 mAh, 15C battery) was 23 BBs/s. We fired 10 shots without adjusting the HopUp or the sights. All shots hit the target. The largest distance between the shots was 17 cm. The replica is very well made. One of its main advantages is definitely a two-part gearbox which, in the case of owning two upper halves, gives a real "quick spring replacement" possibility. 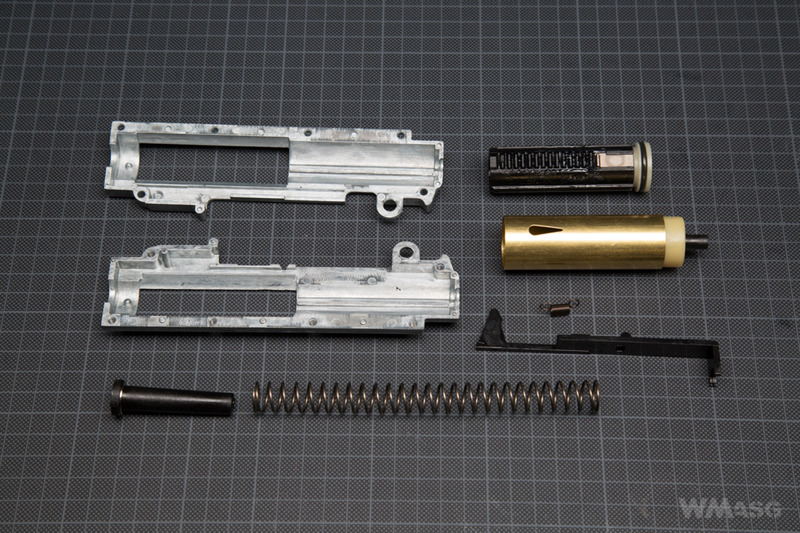 By simply replacing the spring, thanks to the quality of the internal parts, give the possibility of increasing the muzzle velocity to approx. 430 fps. 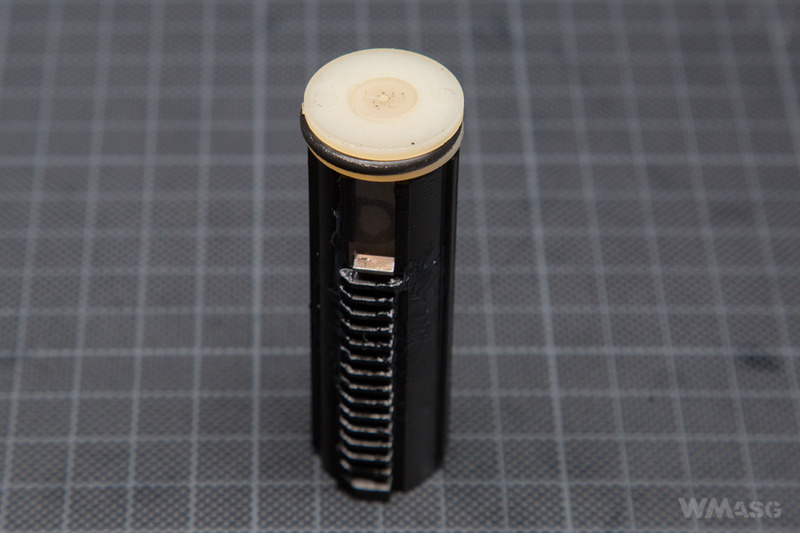 We receive the Peleador with a factory installed MOSFET. On top of that we also get a spring release system. By placing the replica in the "budget replica with a plastic receiver" range, I really can't see any cons. However, I doubt that the Peleadors will achieve market success. Not because of their quality which is relatively at a very high level. I doubt that a replica made of plastic, even if it is a brand name replica, will win with the competition of "full metal" replicas from the lowest and medium price range. But people have different tastes. Thanks to the compatibility of the two-part gearboxes between the series (just remember that it has to be compatible either with the EBB or non EBB version), the Peleador range can be an interesting alternative to creating a second set, e.g. for CQB.